Argyle Fox, with his signature style, wants to play outside on a springtime day, but the wind is wreaking havoc with his fun and games. As soon as he builds a card tower, climbs into a giant spider web, or takes up his pirate sword, here comes the wind: Woosh! Mama Fox tells grumpy Argyle that if he thinks long enough, he will come up with something to do. Following his mother’s suggestion and inspired by her knitting, he works all the pieces of his day together and creates the perfect solution. The story of Argyle teaches that failure is often a path to success and celebrates perseverance, creative thinking, and an old-fashioned springtime activity. This book at first glance is absolutely adorable. I had my five-year-old son sit down with me to read it and since he is part of a school reading challenge I let him read it to me. It isn’t the story that steals the show, though. The illustrations are absolutely stunning and vivid. I could see my son just devour the story visually as well as mentally. The pictures truly kept him engaged. 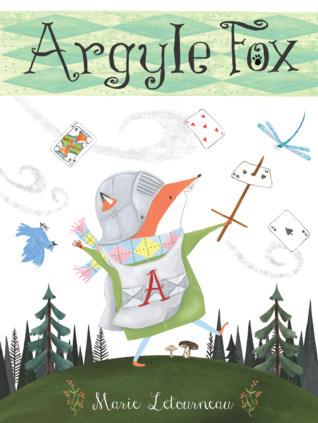 Argyle Fox is a cute book, especially for a bed time read or a new reader. I would definitely recommend it. Do you remember your all time favorite children’s book?